I have yet to see the new Deadpool movie, but by all accounts it’s very popular and people are loving it. The new movie reminds me of the previous Deadpool appearance in the film X-Men Origins: Wolverine. 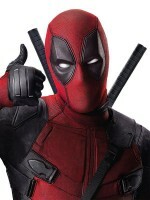 In that movie we first see Ryan Reynolds play Deadpool and people were happy in the early part of the movie because he got the snappy patter part down. The sucky part was at the end, where they made Deadpool the main villain for Wolverine and changed him. As more than one person mentioned, they took the ‘Merc with the Mouth’ and removed the mouth. What the new Deadpool movie popularity shows is why they did this. Imagine if they had Deadpool, as he is in the recent movie, battle Wolverine at the end? Would everybody want to see the hero of the movie Wolverine win? As popular as Hugh Jackman and Wolverine is I think an extended fight scene against classic non stop black humor joking Deadpool would not have worked out so well for him in his own movie. So they decided to change Deadpool into a character that you wouldn’t like and did so by taking away his mouth and his costume. Now it’s clear, cheer for Wolverine and boo the bad Deadpool. You may think they shouldn’t have had Wolverine fight Deadpool in the first place and I agree. Superhero movies always seem to want the villains to have some sort of connection to the characters origin. Examples being the Joker being the one that killed Bruce Wayne’s parents in the first Michael Keaton Batman movie or the hamfisted Sandman connection to Uncle Ben’s death in the 3rd Tobey MaGuire Spider-Man film. The Wolverine movie was supposed to be about Wolverine’s origin and they already used Sabretooth in the first X-Men film. While Sabretooth plays a major role in this film, he was last seen by movie goers as a fairly minor player in the first X-men film who gets killed. This makes Sabretooth an unsatisfying final villain for this film. Another major villain with origin ties was Lady Deathstrike, but she was used and killed in the 2nd X-men film. None of the other characters on the “Team X” would work as the main villain either. I also think felt they had to tie into the Weapon X story line since it’s so featured so much in the 2nd X-men film. There was backstory there and this movie was to fill it. Ideally, they would have done a better job with Sabretooth in the first X-men film (have him kick Wolverine around some then disappear) and used him in the 2nd in a similar way to set him up as the big bad Wolverine specific villain you wanted to see him go up against. Hindsight is 20/20 though, I imagine when they were making the first X-men film they were just hoping the movie wouldn’t bomb and were not planning for a solo Wolverine movie 9 years later. So with all other options gone, they decided the main villain had to be Deadpool, but a version of Deadpool that wouldn’t be liked and that’s what we got. 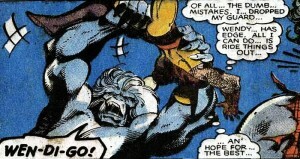 Personally, I’d have liked to see Wendigo be the big villain for the first Wolverine movie. He ties into Wolverine’s first appearance in Hulk #180 & 181 but there obviously wouldn’t have had the Hulk in a FOX movie. They could have brought in Shaman from Alpha Flight to explain/deal with the ‘human soul trapped with the Wendigo curse’ bit. If they go a little further than the comics did at the time and add in the cannibalism part of the origin it would have been a horror movie element to the film, making it stand out. I know when they do movie rights specific characters are put into groupings and I don’t know that Wendigo would have been in the X-men grouping or the Hulk’s grouping since the character has appeared in both characters stories over the years, not to mention many other Marvel characters. The same goes with Shaman, I have no idea of Alpha Flight are their own grouping or if they are part of the X-men.